P.S. : I’m currently in a meeting right now, just reply back. Is that okay with you? I’m currently in a meeting right now and I want to gift out some Gift Cards to some clients today ASAP. I want you to make arrangements to get the gift cards. Is that okay with you? I need 20 PHYSICAL Apple iTunes gift cards of $100 face value. That’s $100 x 20 = $2,000. Note: $100 x 20 qty of Apple iTunes Gift Cards are needed. Once you get the physical cards, you should gently scratch-off silver lining at the back for the pin codes, lay them all out in batches, then snap a photo and email the clear picture to me via email before leaving the store right away. Make sure you email them to me before leaving the store. Is that okay with you? I’m on my way into the office now. I can either drop them by your office, or just leave them at the front desk. Will that work? No, I want them via email.I want you to gently scratch-off silver lining at the back for the pin codes, lay them all out in batches, then snap a photo and email the clear picture to me via email. Is that okay with you? They won’t accept the company credit card – they want cash only for the gift cards. Looks like you’re out of your meeting – can you have someone cut a check for me? I’ll be happy to run it down to the store and pick up the gift cards. You may go to Apple store and try. Is that okay with you? I did. They insist on cash only. How would you like to proceed? Okay, you can pay with your cash. You’ll obviously be reimbursed,is that okay with you? I’m sorry, but I don’t have an extra $2,000 at the moment to front this. I’ll be at the office in 5 minutes, we can talk then. Can you buy $500 card? You want one $500 card or five $100 cards? And which email address do you want me to send to – ofceo@ or off.ceo1@? So I’ve just told them that I’ve noticed that they’ve used two different email addresses to communicate with me. You’d think that this might imply that I’m getting suspicious, but they’re not prepared to give up yet. They went back to the original from address, and added “(Send it here)” to the subject line. I want $100×5 = $500. Lay them out, then snap a photo and email the clear picture to me via email before leaving the store. I won’t bore you with the rest of the exchange. At this point, I just want to see how long I can successfully jerk them around, and whether maybe, just maybe, I can get a mailing address of some kind to send the “gift cards” to. And when I finally run this as far as I can, I plan to email them a link to this blog post, as a “thank you” for helping me demonstrate what a spear phishing attack looks like. So…what should we learn from this? 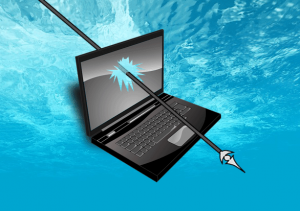 This was a targeted attack (which is what distinguishes “spear phishing” from ordinary “phishing” emails that are blasted out to thousands of recipients). Someone did enough research on Xiologix to identify which individual within our organization was likely to have the authority to make a request like this, and used that individual’s name to specifically target me. Consider that Xiologix is not a large company. We have roughly 20 employees. You might think that we would be too small for someone to go to that much trouble to target us. You’d be wrong. The amount they requested ($2,000) was not an unreasonable amount for a company our size. Trying to scam us for $50K would have been an obvious overreach. Again, you might think that it’s not worth the trouble to only score $2,000 – let alone the $500 that I negotiated down to. But if they can actually score a half dozen times a month, it adds up to a reasonable payday – particularly if this is originating somewhere offshore where there is a favorable exchange rate for U.S. dollars. These guys didn’t care whose money they took. Company credit card? Fine – even if it ended up costing me my job when my employer found out how stupid I had been. My own money? That’s fine too. Can’t afford $2,000? How about $500? They’ll take whatever I’m dumb enough to give them. You are not exempt from attacks like this! Your organization is not too big or too small to be targeted. Whether you know it or not, you probably have already been targeted. If you haven’t been, you will be. It is axiomatic that the “weakest link in the security chain” is the end user. Those of us who are IT professionals may live and breathe this security stuff, but your users don’t. They’re just busy trying to get their jobs done. And one end user who clicks on the wrong link, or responds incorrectly to a phishing attempt like this one, can circumvent all of the expensive technological security solutions you’ve put in place. It’s important to educate your users – using a method that they will actually retain – and then test their knowledge from time to time. We’d be happy to help with that.